Message: The entity set for the 'Xafari.CustomAppearances.CustomAppearanceRule' type is not found. Thanks, we are already researching it. It will take some additional time. Please stay tuned. Thanks, we have reproduced this issue for the from EF XAF project. Sorry, I gave you the wrong info yesterday. 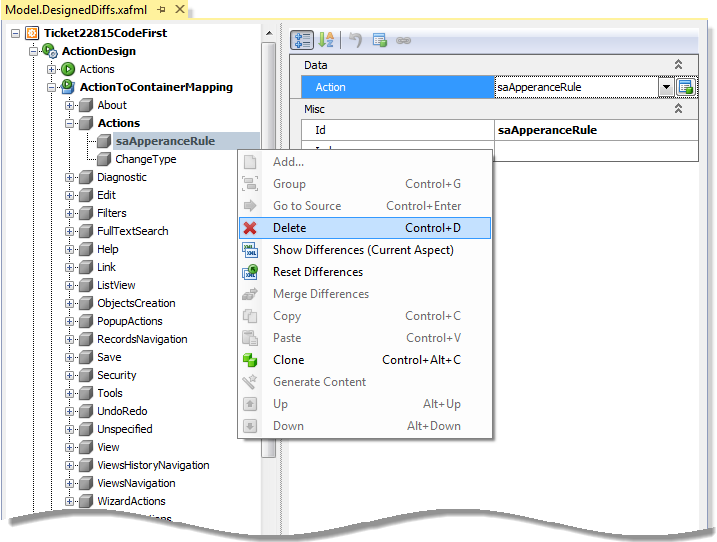 and delete action "saApperanceRule" in ModelEditor (see attached file saAppearanceRule.png). Please try this solution and let me know whether it suits you or not. OK. We will try it. I make a small project which you can check. Also in order to make this project MVC what I should do? Is there a guidelines or getting started tutorial about that? The solution proposed did work and now we have a working starter template with the xafari module.